Unique exterior square top door with a 6-Lite v-groove panel bottom design and 1 sidelite. 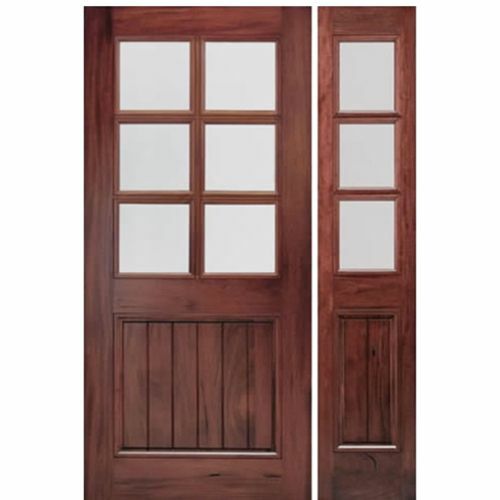 Door is crafted from hand-selected FSC certified South American Andean Walnut of the highest quality to ensure optimal performance and unmatched beauty. This wood retains all the characteristics that age and the element gave it. The natural indentations, distressing and coloration are authentic, giving the door a rustic elegance that man cannot duplicate. This design is desired by rustic architects and designers for its natural distressed look and smooth dense grain. Wood is carefully kiln-dried and is ready for staining.